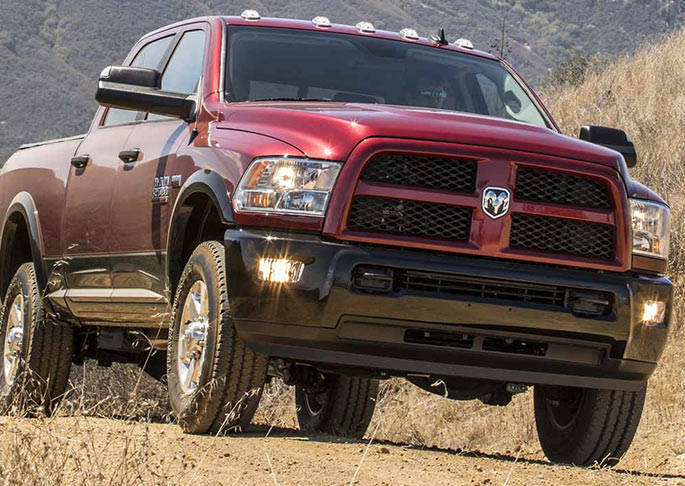 Changes Leaked for 2016 Ram 2500 and 3500 HD? What is the new 2016 Ram 2500 and 3500 HD going to look like. Will it be getting a visual makeover like so many other vehicles in the Fiat-Chrysler family? It seems that Allpar, being the Chrysler sleuths they are, may have found out what to expect. At the 2015 Chicago Auto Show, Ram showed off the 2015 Ram 1500 Laramie Limited. The truck had the visual stylings notable for Ram with a few exceptions. The new grille and tailgate caused a bit of a stir with their new look. Like the upcoming Ram Rebel, the grille is shaped like a X. This new look is what the 2016 model year will, allegedly, look like for the 2500 and 3500 HD. Apparently it will even have unique wheels, something the poster didn’t go into much detail about. The interior will be similar to the 1500 Laramie Limited and will be in all-black and the bumpers are painted with the available choice of chrome as well. Other notable changes appear to be that the center console layout will be getting a redesign and the Longhorn and Limited will get a new wooden sliding door. As far as engines, the new models won’t change much. There will possibly be a new compressed natural gas option, again with not much details there. Allpar has a knack for getting these things right and we might be finding out more official info here soon as the production is slated to begin on July 20th with deliveries taking only a month or two to get out to dealerships. We’ll keep our eyes peeled for more info. 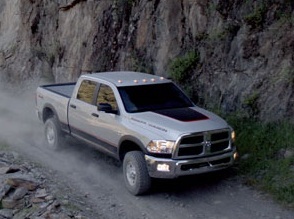 Learn more about Ram trucks, including the 2015 Ram 2500 and 3500 by contacting us at Bayside Chrysler Jeep Dodge. View our new and used line-up on our website. Be sure to download our mobile app to keep track in real time of your vehicle when it is brought in to be serviced. Like us on Facebook, follow us on Twitter, and subscribe to us on YouTube to see more auto news and monthly specials. The Dodge Dart’s rebirth is currently the talk of the auto world in concern of new vehicles that are coming out. The public attention is focused on seeing how well the car comes out and with the onslaught of advertisement towards its impending release, people aren’t really thinking about what’s next. Some keen eyes may have just spied what’s coming down the road after the Dart. Allpar.com has a news story about a possible sighting for the new truck that Ram is planning. Someone has spotted and posted pictures of what may be the Ram 4500 out on a test drive on public roads. Ram has stated that they are planning to deal with the Ford and GM heavy-duty pickups that are coming out. Ram has already stated they are hoping to get a new truck out there, but it won’t be until a 2017/2018 time frame. 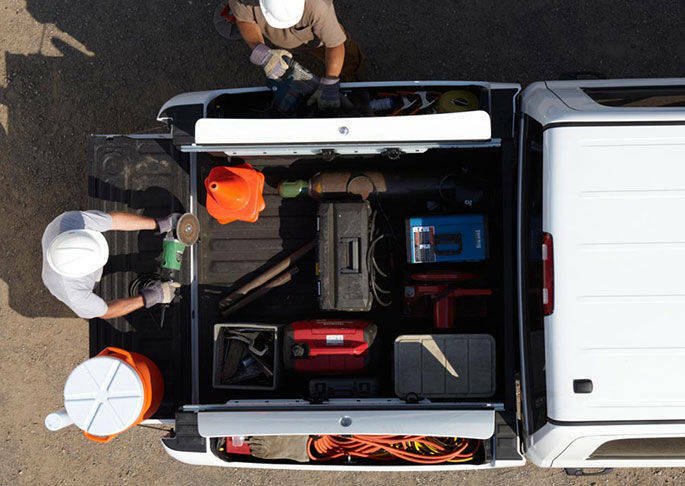 Allpar has a run down of the rumors about what may be features on the new Ram heavy-duty truck. One such feature will be an optional air suspension system. The system being quoted by an unnamed source as being “better than the on in the Grand Cherokee.” Another is something called the Long Hauler concept which will allow for higher capacity with a smoother ride. Obviously nothing is for certain as of yet and this is all just assumptions, but it still an indicator of what may be coming soon. Definitely something for truck fans to start getting excited about. For more information on Ram trucks and to view models online, head on over to the Bayside Chrysler Jeep Dodge online show-room. To stay up to date on all the latest truck news, like us on Facebook and be sure to follow us on Twitter.